(NaturalNews) The growing epidemic of farmer suicides in India can be directly traced to the introduction of genetically modified (GM) Bt cotton by multinational corporations, reveals a new paper published in the journal Environmental Sciences Europe. A research collaborative spanning multiple continents found that GM Bt cotton doesn't improve yields as claimed by industry and actually drives farmers so much into debt that they often see no way out other than self-inflicted death. It's a horrific phenomenon, but one that's being largely fomented by the biotechnology industry in its endless pursuit of agricultural dominance and financial preeminence throughout the world. Indian farmers don't, in fact, need GM Bt cotton, but a systematic propaganda campaign launched in the 1970s led them to believe this lie, which has now resulted in some 90% of the country's cotton crop having been converted to transgenic. Now that GM Bt cotton is the norm in India, farmers there are coming to the harsh realization that they've been duped. Not only does GM Bt not protect against the pink bollworm, but it has also led to an increased dependence on expensive and proprietary crop chemicals, which together with patented, non-renewable seeds has driven many Indian farmers to bankruptcy. "Yields in rainfed cotton depend on timing, distribution, and quantity of monsoon rains. Pink bollworm causes damage in irrigated cotton, but not in rainfed cotton unless infested from irrigated fields. Use of Bt cotton seed and insecticide in rainfed cotton is questionable." This is a tactful, if not timid, way of saying that GM Bt cotton is basically useless when it comes to the cotton cultivation methods long embraced by traditional Indian farmers. But even the industrial, irrigation-fed cotton of today doesn't benefit from GM technology, according to the paper, which quickly wanes in effectiveness while leaving farmers locked into onerous contracts with Big Biotech. 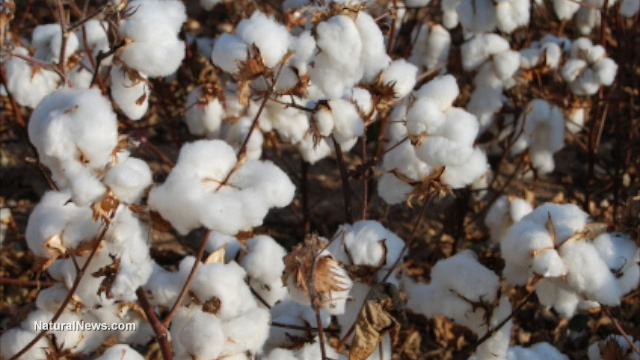 "Inability to use saved seed and inadequate agronomic information trap cotton farmers on biotechnology and insecticide treadmills," wrote the authors. "Annual suicide rates in rainfed areas are inversely related to farm size and yield, and directly related to increases in Bt cotton adoption (i.e., costs). High-density short-season cottons could increase yields and reduce input costs in irrigated and rainfed cotton." The takeaway, in other words, is that GM Bt cotton isn't needed either for rainfed or irrigated cotton in India. It's always been an industry lie that Indian farmers need to purchase patented products from companies like Monsanto in order to generate high yields and protect against pests, when in reality these technologies have resulted in massive destruction and loss of life in this developing area of the world. Even the Indian government is beginning to recognize the ruse, with some officials speaking openly about the need for Indian farmers to explore non-GMO options in order to release the biotech shackles that are strangling their operations and destroying the country's agricultural network. "Cotton farmers are in a deep crisis since shifting to Bt cotton," stated India's agriculture ministry in a 2012 advisory. "The spate of farmer suicides in 2011-12 [which continues to this day] has been particularly severe among Bt cotton farmers." "In fact cost of cotton cultivation has jumped... due to rising costs of pesticides. Total Bt cotton production in the last five years has reduced."